With Optel’s Process Traceability and Enforcement capabilities, process routings and data collection are automatically controlled at the serialized circuit level, throughout the production process via hand-held scanners, fixed location scanners, and machine interfaces. Circuit assembly serial numbers can be scanned at various data collection points, from the screen printer through shipping, to ensure accurate and automated recording of every process step. Optel tracks, controls, collects process parameters, and enforces routing operations per serial number, which allows manufacturers to ensure process compliance. Three levels of enforcement are available for configuration, depending on the specific need for production process control. Electronic work order job travelers are available online, in real time, which eliminates the potential loss or misplacement of paper job travelers and provides a permanent record for customer proof-of-process requests. In compliance with IPC-1782 Traceability standard, Optel collects the following common process traceability data for every operation: operation name and ID, date and time in/out, cycle time, operation documentation ID, program/setup data (name/revision/date), significant downtime, date of last preventive maintenance, start time and duration for in-process exception/maintenance/adjustment, environment (temperature and humidity). 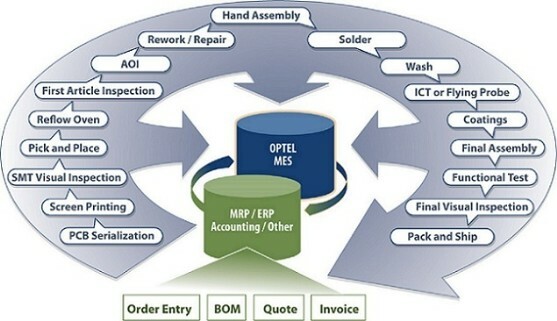 Real time communication between Optel and the machines in the process center provides complete control of the process. Screen printers can be controlled to ensure correct paste and stencils are used on lead-free assemblies and to control solder paste expiration date and stencil cycles before maintenance is required. Pick and place machine programs are loaded from the central database to the machine based on work order, eliminating the possibility of the wrong program being used. The tact time is measured, and if the solder paste is past its tackiness spec, the panel can be prevented from entering the pick and place machine or reflow oven. Enables an effective feeder management strategy based on duty cycle instead of calendar days, reducing machine downtime and lowering maintenance costs. Collects zone temperatures and ensures correct recipes is loaded on the reflow oven, and prevents a board from entering reflow oven if zone temperatures are outside limits, using SMEMA control. The test data is collected in real time and if a defect was found it is loaded in the database, assigned to the serial number, and that PCB marked as failed. Optel provides real time interfaces with AOI, ICT, LCR, Hi-Pot, and functional testers and real time defect data collection. First article inspection and visual inspection use graphical board layout to support visual defect data collection. Optel’s shipping module is used to track packing and ensure no product is shipped that missed a routing operation or has a defect still opened. Real time process traceability reports are provided. Comply with the most strict traceability standard requirements. Ensures all operations are completed. Ensures all defects are fixed. Ensures that only valid products can be shipping.